The Chattahooligans cheer before Chattanooga Football Club's NPSL national championship match against the New York Cosmos B on Saturday at Finley Stadium. At 8:02 on Saturday evening, with the Chattanooga Football Club's National Premier Soccer League championship game against the New York Cosmos B already 20 minutes old, CFC co-founder Tim Kelly stopped by the Finley Stadium press box long enough to announce, "We're literally almost out of tickets. We're going to have to use last year's tickets to let people in." Talk about giving a whole new meaning to the iconic line: "It's football time in Tennessee." What we had Saturday night on the Southside was one of those sports moments that will be revisited in the Scenic City for decades to come. 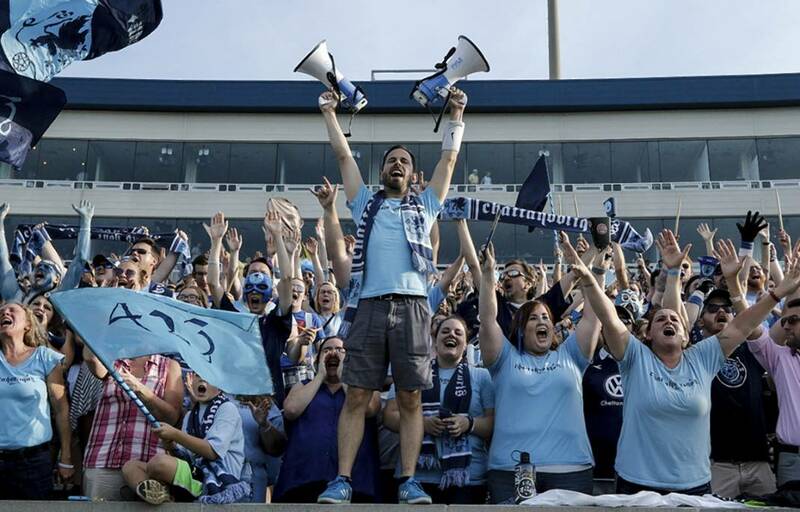 Only 20 years from now, there may be 35,000 people in our town claiming they were one of the 18,227 folks wise enough to make their way to Finley for the biggest soccer night in Chattanooga's history. No, it didn't end well. The wrong team won, though it took the Cosmos extra periods to claim a 3-2 victory. And even then the outcome wasn't guaranteed until New York goalie Kyle Zobeck stunningly stopped Samuel Goni's point-blank kick with less than 35 seconds to go. That said, there's a reason why New York was the league's best team all season, a nearly irresistible offensive machine. Befitting a franchise that, in another life and league, once employed Pelé, the Cosmos could find a weak spot in the Great Wall of China. And their coach, who once played with Pelé, gave the Chattanooga crowd — reportedly the largest to ever view an amateur soccer match in the United States — much credit for making this the great, tight game that it was. "I've played in big games, in packed stadiums," said Alecko Eskandarian, "and this was as good an atmosphere as I've ever seen. There were times when you felt like we were playing against 18,000 players on the field." Or as Chattanooga coach Bill Elliott, who played high school soccer at Hixson, said, "The crowd was unbelievable." Unbelievable and indescribable and so wonderful you felt the need to trot out the Mary Poppins word to end all words — supercalifragilisticexpialidocious. It started long before this game began, the fans appearing as early as 4 p.m. for a kickoff at 7:42 p.m. The parking lots adjacent to the stadium were overrun by 6:30, despite most charging $10. By 7, there were easily more than 12,000 inside the stadium. By match's beginning, that number had swelled to close to 17,000. And they kept coming. And coming. "In some ways, this is a function of being in the right place at the right time," Kelly said in the final moments before Caitlin Hammon Moore delivered another perfect rendition of the national anthem, much as she had two days after a terrorist act senselessly took the lives of four Marines and a Naval petty officer in our once-innocent city. "I certainly think the tragedy generated a lot of love and sympathy for Chattanooga," Kelly added. "I also think some of this has been as much about civic pride as soccer. This is very much about the level of love for this community. But I also believe we're becoming a mecca for this level of soccer.We've got a lot of soccer converts in this area." One of those is Galen Riley, the unofficial chief cheerleader of the Chattahooligans, who have done so much to make Finley feisty over the years, regardless of the overall size of the crowd. A near-constant presence since 2009, even Riley was stunned by the crowd, saying, "If you'd told me then that we would pack this place for the New York Cosmos, I'd have called you a liar. This was just an amazing atmosphere." The selling of beer surely helps. The second loudest cheer of the night — other than the tying score delivered by CFC's Chris Ochieng in the match's 68th minute — arrived when they announced that beer would be sold through the first 15-minute bonus period. The Hooligans have become so big that the Chattanooga Brewing Company's newest brew is called "Chattahooligan lager." And all of it — the beer, the tragedy, the chance to see a national championship come to Chattanooga — certainly helps. After all, everybody loves a winner, regardless of the level of play. But something happened inside Finley and throughout our town over the past 24 days following the July 16 terrorist attack that almost never happens for communities these days. Or as 25-year-old Lauren Bailey mused at the start of the second bonus period, "This is the feeling you're supposed to get at an event like this. Especially after all we've been through the last few weeks." The feeling you're supposed to get. Absolutely. And perhaps we'll feel it again 10 days from today, when the Women's World Cup champion U.S. team arrives for its exhibition match against Costa Rica. Because no matter how much you love your city, you should love your country and those who represent it all the more. You wonder, though, if the passion will be as great as it was Saturday night, when you could barely hear yourself think, the roar was so loud and long. "This night," said league commissioner Joe Barone, "will be hard to replicate in the future." And it will, but that doesn't mean it can't happen again here. Or as CFC board member Marshall Brock noted, "We really believe in the power of this great sport to bring people together." And he's got proof of 18,227 folks crammed into Finley for an amateur soccer match to strongly support his argument.